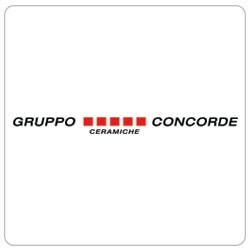 Founded in 1969, Gruppo Concorde has now established itself in a leading position in the ceramic industry sector across the world thanks to the ethical vision of its mission, with its deep rooted values of innovation, research, internationalization, strong territorial presence, respect for the environment and social responsibility. With production sites located in Italy, France, Russia and in the USA, Gruppo Concorde is testimony to the strengthening of their presence in the local territory as well as the demonstration of an ongoing international path, with the goal of becoming a major force in the most important markets in the world. Each single company that is part of the Gruppo Concorde operates autonomously, with different products and strategy, so as to position itself into a specific market segment. The group puts a number of key central structures at the disposal of companies, thus creating synergy and efficiency. The results of Gruppo Concorde are based on substantial investments in research and technological development that have led it to the introduction of advanced production innovations and to obtain the ISO 9001 and ISO 14001. Gruppo Concorde’s brands aim at a high profile strategy in which the technical performance, design, quality and marketing are combined with attention to the social environment and to establish the added value of being Made in Italy more authentic. Gruppo Concorde has always focused on and continues to invest in young people with high potential who seek excellence, willing to confront challenges in a competitive international environment. Concorde builds its evolutionary future on the professional skills of its staff. The established internal appraisal system via internal lines, which follows flexible career opportunities, requires intensive training and constant updating of personnel at all levels. Moreover, the companies in the group have periods of work placement for young people who already hold a diploma or a degree and offer them first professional job opportunity.